Usually we stop and reflect on our deeds (or lack thereof) at year end. Ask anyone, I am definitely one of these people (you might even find a post about it here). However, when I realized that a year had passed since I first ventured into the scary realms of this corner of the internet called blogging, I stopped in my track. It was not the end of the calendar year, but an important milestone in my life. It took me, however more time than usual to be able to put what I felt into words. For there was a whirlwind of thoughts and emotions that I didn’t quite know what they were. In fact it took me a week long hiking trip in the wondrous woods of the Bükk to finally get it. A year has passed, and I gotten a year older. But as not only the second, but the first number character flipped – from 3 to now 4 – it got a bit strange. Strange, because I started hearing the “Oh, believe me there is life after 40” jokes and I just didn’t get it. I felt nothing of the worry, anxiety that others told me I should. Hiking in the quiet forest, hearing nothing but my panting while climbing the mountain I had plenty of time to think and reflect. And that is when it hit me: I never felt more alive, more happy and more like I am in my own skin then right now, when I did turn 40. And the why is right here, written all over this little diary I now call my blog. 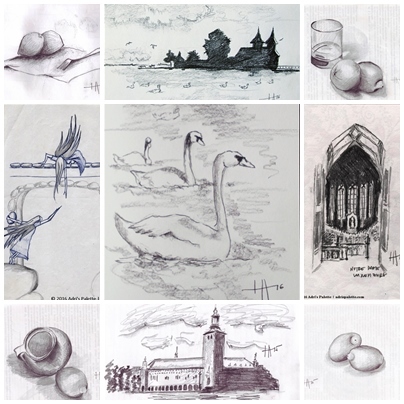 From left to right: Still life with fork, Lake Balaton – Keszthely, Still life with lemons and a glass, Angels on glass, Lake Balaton – Swans, Notre Dame, Still life with lemon and vase, The City Hall – Stockholm, Still life with lemons. 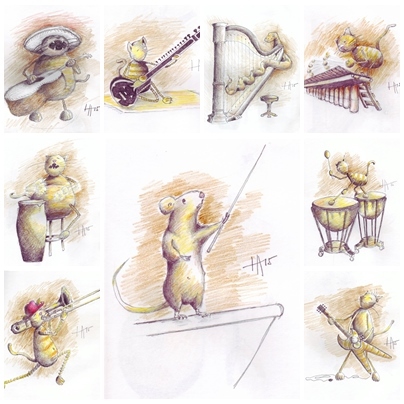 Selection of drawings from The 100-Member Kitty Band series. 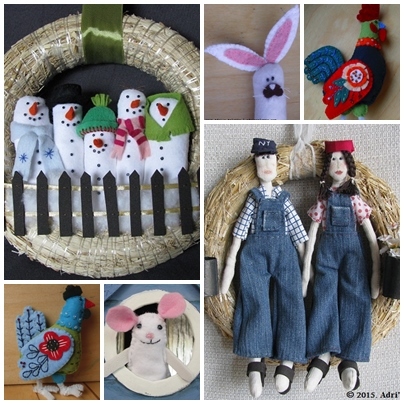 From left to right: Family Frost, Bunny, Rooster, French Hen, Scrummage the mouse, The Gardeners. 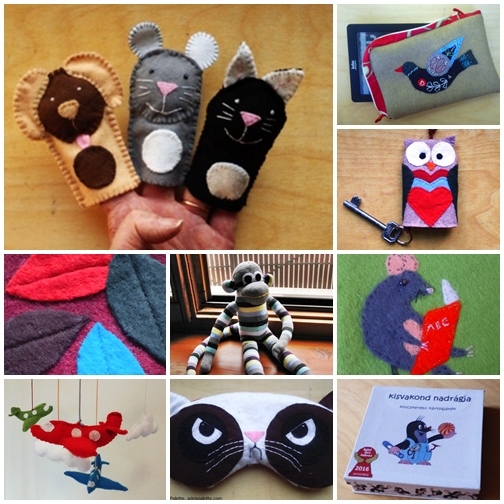 From left to right: finger puppets, e-reader cozy, owl keyholder, mobile cozy (detail), sock monkey, mouse applique, airplane mobile, Grumpy the cat, The Little Mole’s Trousers – Treasure Seeker Card Game. In a short year I turned from an avid social media recluse to someone who has found her voice in this realm. From someone who thought of art as chachkies a year ago thinks of it now as one of the most important things in her life. 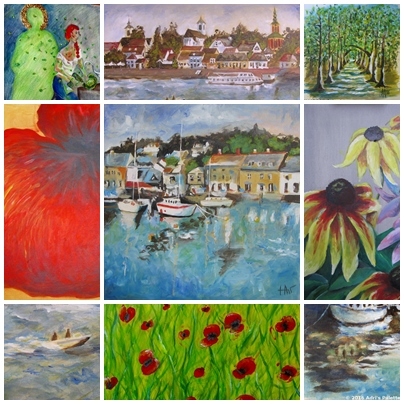 Through the rediscovery of my love for creating art I found unexpected techniques, materials, tools. I found long forgotten sets of pencils, pastels, even a box of oil paint so old it solidified to a rock right in the tube. Art has put down its foot in my fantasies and dreams so hard in fact, that it has solidly shoved out Excel files and Power Point presentations, my demons from them. But something I was not expecting is that what I make is somethings others would find inspiring. That there would be more than 700 of you out there who read this blog on a regular basis. I cannot be thankful enough for the friendships I’ve made through the blogging community. The inspiration, ideas we’d share, the discoveries they’d initiate. I never in a million years thought that a musician who inspired me would actually find the drawing I dedicated to her and post it on her Facebook page. So when more and more people around me at this age start turning inward and lose their footing and inspiration in life, I think I found mine. And so something that started on a whim, something I did not expect to last more than a week is now here to stay. Hope you stick around with me for more!